RockStok 2019 is the Rock n Roll Event that will have the Tampa, FL Metro Area rocking. RockStok is the first of its kind of event allowing the fans to vote in the lineup process. On March 2nd of 2019 RockStok Entertainment LLC presents an event to bring back some life to the Tampa area of Florida, an event that we hope to bring back many years in the future to the area. This event has been organized a little different than most. We let the fans make a choice in the lineup by going to our website www.rockstok.com and voting on the Ballot page for a 3 month period (which ended Sept. 12th). With overwhelming votes and emails we have already confirmed 5 of the bands on the event line up. With Outstanding Votes of over 17,000 STONEBREED from Los Angeles, California was the first band to be announced. Then EMP Label Group recording artist KILLER DWARFS from Canada was also added to the lineup. Frontiers recording artists L.A. 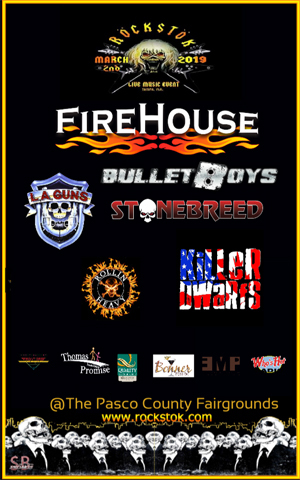 GUNS and the BULLETBOYS are also now on the lineup. FIREHOUSE will be the festival's headliner while Florida's own ROLLIN’ HEAVY will open the show. There are still two more bands to announce so stay tuned! The Thomas Promise Mission is to provide Pasco County's most valuable resource - our school children - with the simplest things that most of our kids take for granted. Each week they pack over 1,000 backpacks with safe, non-perishable, and nutritious food to see them through the weekend when school meals are not available. They also help with field trips, school clothes, and sports expenses for kids that might otherwise do without. Join your friends and neighbors in helping us help our kids. We will be donating a $1 dollar from every ticket sold to this organization as they will be a sponsor on our event. We have Metal Joe and his Knight Rider car coming out for a meet & greet, pics, etc as well as signed items by Jesse James Dupree of JACKYL to raffle off so far. More information coming on that and much more. We hope to see you at RockStok 2019. Tickets are on sale at www.rockstok.com. V.I.P., Reserved and General Admission are available. We are expecting up to 10,000 ticketholders.